According to Nuclear Regulatory Commission spokesman Scott Burnell, the Atomic Safety and Licensing Board, a panel of administrative law judges, will determine whether the groups’ contentions should be introduced as part of the hearing on the permit. There is one operational nuclear reactor at the electricity-generating complex in Monroe County’s Frenchtown Township, known as Fermi 2. Fermi 1 shut down in 1972. Among the coalition’s 14 objections is that DTE Energy, the power company that is seeking a permit to build the Fermi 3 reactor, has failed to adequately consider the impact of cumulative toxic discharges into Lake Erie and the Great Lakes system. The reactor’s use of Lake Erie water for cooling as well as planned and permitted and unplanned releases of radionuclides into the lake will damage fish and degrade the Great Lakes basin, which already hosts 33 licensed nuclear reactors, critics argue. And spent fuel from the plant will be kept on site — perhaps forever, since the Obama administration has withdrawn support for the planned Yucca Mountain nuclear waste storage facility in Nevada. The presence of nuclear waste so close to the water supply for tens of million of people represents a threat to security and the environment, the groups contend. The coalition says that the emergency response planning for the plant is inadequate and that the five Jefferson district schools within a five-mile radius of the plant do not have adequate buses to evacuate students in the event of an emergency. In discussion of concerns about potential human health effects, the anti-Fermi coalition included two Michigan Messenger dispatches in its filing with the Nuclear Regulatory Commission (NRC). Michigan Messenger has been the only news outlet to report on new studies that warn of a possible link between increases in cancer and operations at Fermi. In November, Michigan Messenger reported that Professor Janette Sherman of Western Michigan University had published a study that found an increase in childhood leukemia deaths near older nuclear reactors. In January, Michigan Messenger reported on an analysis, by Joseph Mangano of the Radiation and Public Health Project, of the Centers for Disease Control and Prevention data on cancer deaths among young people in Monroe County. Mangano found that Monroe cancer rates had increased dramatically since operations began at Fermi 2 and he urged public health officials to investigate. In February, in response to a request by Michigan Messenger, the Vital Records Division of the Michigan Department of Community Health generated a report on cancer trends among young people in Monroe County. With the help of epidemiologists from the University of Michigan, Michigan State and Western Michigan University, a Michigan Messenger analysis noted that the cancer rate among people under 25 in Monroe County appears to have grown at three times the rate of the state as a whole between 1996 and 2005. Also, following Michigan Messenger reports on concerns about elevated cancer rates in Monroe County, the Michigan Department of Community Health this week agreed to investigate cancer patterns there. Environmental epidemiologist Robert Wahl of the department’s Environmental Health Division explained that while the state compiles data from clinicians on cancer cases in the state it does not have the resources to evaluate that data for trends and relies on citizens to alert the department when worrying cancer trends appear. Wahl said he would use Michigan Messenger’s reporting on Monroe County cancer rates as a starting point for analysis of cancer trends there. Nuclear or atomic power subject to guidelines does benefit the ecology. Yes, there's concern about atomic waste, but the focus must be on how to make nuclear waste harmless & how to reuse it. If nuclear waste can be made harmless & usable, then the issue is moot. In fact, the focus must be on how to make all toxic wastes harmless & usable. France gets 75% of it's power from nuclear. Japan has used nuclear power for years & they were victims of nuclear weapons during the war. Nuclear power for peaceful purposes & with moderation does benefit the environment. The EPA & Pew Center support nuclear power on a case by case basis. Sure, wind, lightning, geothermal & solar are fine-those energy sources have been around since time started while nuclear has been around since the 1950s. The alternative energy sources don't generate as much energy & many people also have the NIMBY attitude when it comes to windmills. Nuclear power with guidelines benefits the ecology. It must be noted that since 1996, ecologists are split on the topic of nuclear power. Nuclear power doesn't emit greenhouse gases. The newer nuclear powerplants emit less waste, don't require as much Uranium & they've now understood how to make more energy in nuclear powerplants using less Uranium. Audubon Magazine has published letters from ecologists who support nuclear or atomic power. Stephen Tindale, former executive Director of Greenpeace U.K. used to be against nuclear power, but Mr. Stephen Tindale now supports nuclear power. Greenpeace U.K. in it's 2009 recommendations was neutral on the topic of nuclear power. Yes, they suggested alternative energy sources. But Greenpeace Great Britian or U.K. unlike past years didn't condemn nuclear powerplants & perhaps they're rethinking their earlier view. The fact is that since 1996, more ecologists are rethinking or have reconsidered their prior position against nuclear powerplants & there are ecologists who support nuclear or atomic power. 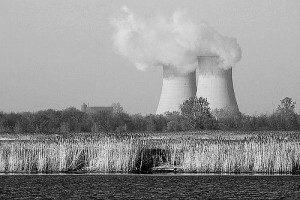 Nuclear powerplants can be consistent with ecology. So how does this preclude the radiation and same pollution emitted by the second largest coalburner in the country just down the coastline? It doesn't. That's the absurdity I'm talking about, attacking the lesser of the evils with vehemence while basically overlooking the worst health risk in Monroe--that coalburner. Just reading what you've written here I see that the cooling towers of a BWR have been referred to as stacks relative to the same stacks of a coalburner. Cooling towers cool boiling water that runs through pipes to create the steam that turns the turbine. That water is not in contact with radiation. The heat emitted from the nuclear fission contains some radioactivity but far less than that emitted by a coalburner. How do you plan on separating these entities relative to fault when they are in such close proximity to each other? I'm only in agreement with you here if you go after the source for the OVERALL pollution to the entire Monroe area, but to try to label the Fermi plant as the primary source for the rise in cancer for Monroe, which I've readily acknowledged, is ludicrous. I look at the towers of the Fermi II plant out my front window, and I write an environmental blog for the Monroe News. This opposition is a little absurd to me. The Fermi II plant has already buried radioactive waste on the land there. The point of stopping pollution of that sort is long gone--too late. The buried radioactive waste is the biggest threat from a nuke plant especially a boiling water reactor where the water lines are not under pressure. Professor Sherman's study may have indeed found a link between leukemia but it specifically states older nukes, many of which were fossil fuel like Fermi I, a leaking radioactive disaster. If the amount of radioactivity emanating from the Fermi II plant is enough to cause these health concerns for just living in the general area, than the people that work there daily should be growing a second set of ears or eyes by now. You see, I also worked at the Fermi plant for 8.5 years collectively first for the Asst. Project Mgr, then for the Quality Assurance Manager that answered only to the NRC, and finally as a laborer that climbed and crawled through every inch of that plant. How many nuke plants in the world, and how many problems to date? Russia doesn't count because everything they did never considered the health and well being of their people anyway. Sweden, one of the most environmentally sound countries is full of nuke plants. There biggest problem is again the disposal of radioactive waste. This same opposition would be wise to focus their attention on the second largest, filthy coalburner in the country instead. Yeah, cancer rates in Monroe are definitely up. It's been commented about in our hospital system plenty. Where was all this opposition against running that coalburner for decades without any scrubbers as a minimum precautionary health measure? It's too late now for all the people that have suffered bronchial problems and probably cancer from that coalburner, not to mention the methyl mercury occurring in our lakes. I live on the water too and won't eat anything from there. Ever see the big tumors on large walleye? Take one look at the brown smoke emitting from those stacks on a regular basis if you want to start the cancer trail. There was also the Holcim concrete plant in Ida emitting so much pollution from burning tires you could smell it, and see it driving down US 23, yet Senator Richardville was ready to write an amendment to keep that plant going to save 350 jobs. It's been downsizing to close for years. Holcim was fined hundreds of thousands by the EPA for going over the particulate limits by 7x's the acceptable amount for public safety. I didn't see a big opposition to Holcim, but the opposite. And we're worried about the Fermi III plant? How absurd. I seem to be the only one consistently writing against Monroe's coalburner, the mercury polllution, the trash dump that is far too close to Lake Erie, and the now closing Holcim Plant. Out of all of these polluting industries the Fermi II Plant is clean by comparison using boiling water to turn its turbine. As for the radioactive waste, like I said--too late anyway . That's what the land was purchased for decades ago. I think people in this area need to pick their environmental fights better. I am glad, however, that someone is finally doing an air study of the Monroe area. A friend and myself talked about getting funding to do such a study. We were going to gather data based on homes from nearest to farthest in proximity to Monroe's coalburner in a pattern of concentric circles with a 5 mile radius for each, i.e., 1-5 miles, 6-10 miles, etc., away from the plant. In the 1980s, the cancer rate for young people in Monroe County was below the state average. In the ’90s this rate grew, and in the first half of 2000 the cancer rate for this group in Monroe was greater than the state average. For the period 1999-2004, there is data to compare the Monroe under 25 cancer rate to both the Michigan and U.S statistics. The rate was 23.5 per 100,000 in Monroe County, 21.5 per 100,000 in Michigan and 19.5 per 100,000 nationwide, according to the Centers for Disease Control (CDC). Dr. Janette Sherman, adjunct professor at Western Michigan University’s Environmental Institute and author of “Life’s Delicate Balance: Causes and Prevention of Breast Cancer,” has spent her career researching environmental causes of cancer. She said that cancer among young people should be viewed as an indicator for radiation problems associated with nuclear plants. More data from studies could only be a good thing when the lives of Monroe's young people are impacted disproportionately.